View the drop-in event notice. Public consultation identified safety and connectivity as the highest priorities by stakeholders and the general public. The new cycling infrastructure is designed to provide a dedicated space for cyclists, improving safety and comfort for all road users. 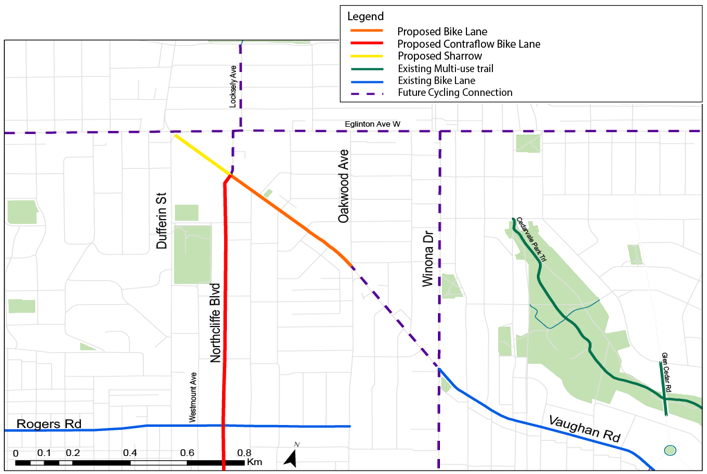 The bike lanes will expand the local cycling network by providing improved connections to the existing bike lane on Rogers Road and the future cycle tracks on Eglinton Avenue. Bike lane: a dedicated part of the roadway for the exclusive use of cyclists. 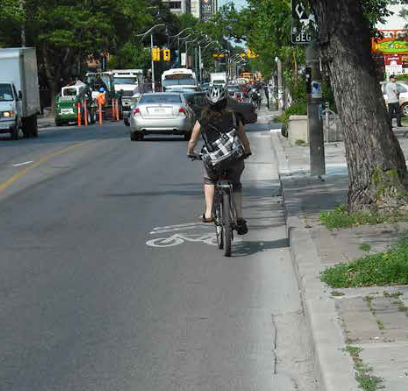 Other road users may not lawfully drive, stand, stop or park in a designated bicycle lane. 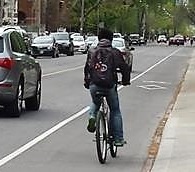 Contra-flow Bike Lane: allows cyclists to travel in two directions on a one-way street (cyclists travel in one direction in the designated bicycle lane and travel in the mixed-use traffic lane or marked cycle lane in the opposite direction). Shared Lane Markings (Sharrows): road markings used to indicate a shared environment for bicycles and motor vehicles.